Make learning compound words in your classroom fun by having students solve word equations. The visuals on these compound word task cards also make it great for some students who are more visual or that need some extra intervention. 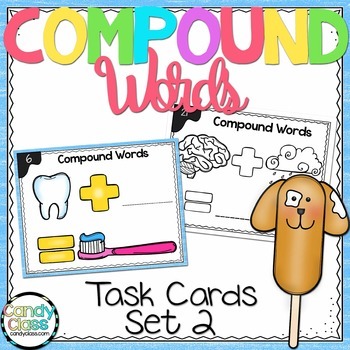 I've included the task cards for compound words in both color and black & white! Recording sheets are also included. The bonus cards with words are great for differentiating instruction with students who might need some extra guidance with compound words. 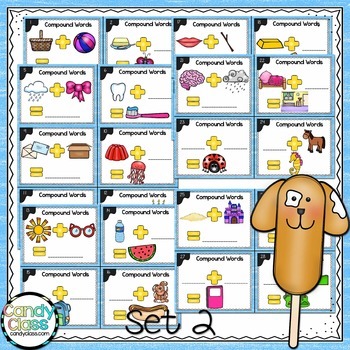 If you would like to have task cards that cover every CCSS standard for second grade language (the grammar and vocabulary standards for second grade), I have a mega bundle that does that! These cards are included in the mega bundle. If you bought the mega bundle, you already got these cards.Click here to check out the Language Task Card Mega Bundle for Second Grade. This resource for compound words is for personal use only and one license is a single user license for one teacher.